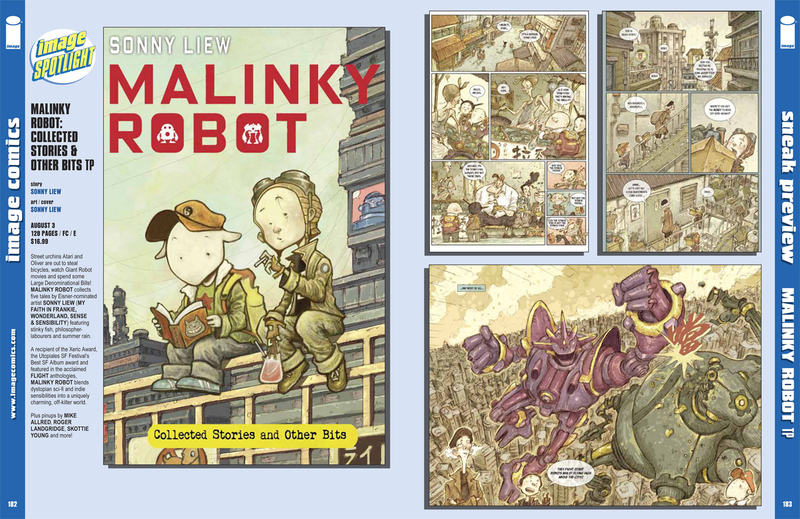 The english collection of Malinky Robot is out on August 3 from Image comics. Featuring stories from the French and Italian collections (Stinky Fish Blues, Bicycle, Karukuri, Dead Souls Day Out), as well as a new piece (New Year’s Day). Also includes pinups by Mike Allred, Koh Hong Teng, Roger Langridge, Skottie Young, FSC, Arron McConnell, Tony Sandoval , Nicolas Bannister, Gary Choo, Nicholas Jainschigg, Evan Larson, Robb Mommaerts and Nancy Zhang! A recipient of the Xeric Award, the Utopiales SF Festival’s Best SF Album award and featured in the acclaimed FLIGHT anthologies, MALINKY ROBOT blends dystopian sci-fi and indie sensibilities into a uniquely charming, off-kilter world.